Mint Chimichurri – Olive For Greens. 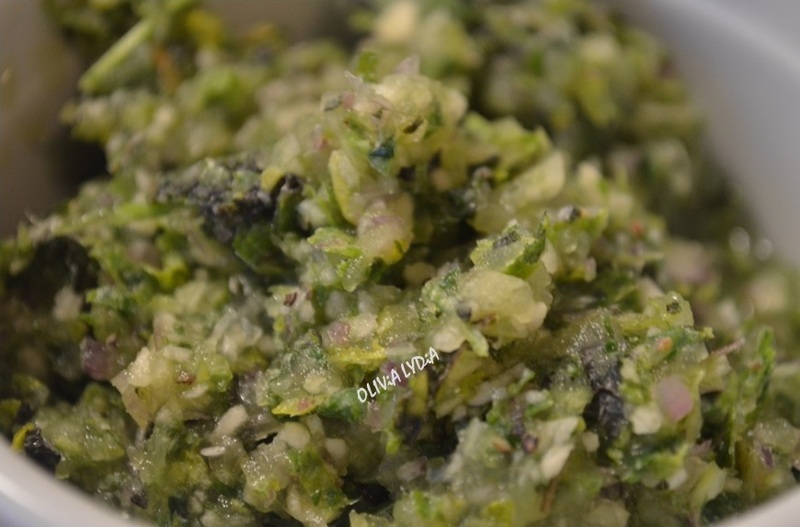 Chimichurri is a piquant sauce or marinade traditionally used on grilled meat, typically containing parsley, garlic, vinegar, olive oil, and flakes of chili pepper. It is traditionally used in South American and Mexican cooking. [source] Now, my recipe has most of those ingredients however when I created this Mint Chimichurri, I just blended everything together and didn’t know what it was called! It was a simple kitchen improv experiment. My Mint Chimichurri can be added to veggies, rice or pastas for an extra flavor boost (see “how to” below)! All of the ingredients to a food processor. Blend until smooth. In a pot or pan, add a bit of coconut oil or olive oil. Add the Mint Chimichuri and saute for a few minutes. Now add the veggie or rice (or whatever using).